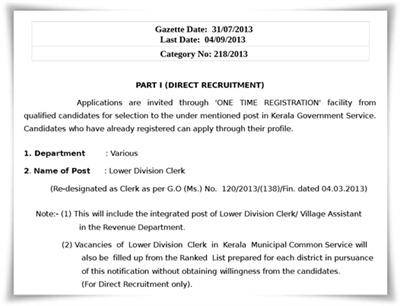 As the Kerala PSC decided to publish the rank list of Lower Division Clerk (LDC) in March 2015, as per procedure the probability list with names of selected candidates would get published before 15th September 2014. The Lower Division Clerk exam (category No: 218/2013) for all districts (Thiruvananthapuram, Kollam, Pathanamthitta, Alappuzha, Kottayam, Idukki, Ernakulam,Palakkad, Thrissur, Malappuram, Kozhikkode, Wayanad, Kannur and Kasaragod) was conducted from 9th November 2013 to 22nd February 2014. After the publication of the probability list, the certificate verification will be held in October extending it to November and December. After the final procedure, the main rank list will be published on 30th March 2015 as the validity of the current rank LDC list come to an end by 31st March 2015. As per available information, the probability list will consist of 25,000 persons from all 14 districts. 3000 candidates will find their place in the list from Thiruvanathapuram while 1000 each would enter the top list from Idukki, Wayanad and Kasargod. According to report published by a leading employment news weekly, out of 56,706 candidates who have made into the previous rank list, 6739 among them only got the employment memo. This means that, from those who made into the final list only 11.88% could sought the employment letter. As the new rank list get published in 2015, it will take away the chances of those are in the job bank. The valuation of the 16 lakh candidates is currently progressing in full swing. Along with the main rank list and supplementary list, a special list for Physically Challenged candidates will be published at the official website of Kerala PSC. Having a pay scale of Rs 9940 – 16580, the list of selected candidates published by the PSC shall remain in force for a minimum period of one year. Out of the vacancies reported, 3% shall be reserved for appointment of physically disabled persons. The upcoming rank list would open doors for a number of many youngsters who had been carrying dreams to get a job with the Kerala government.